← Advice: When to embrace vs. ignore? ‘Nice. Happy. Fun.’ So read my picture’s caption on my 3rd grader’s All About Me poster. She is VIP in her class this week. Amidst the photo cut outs of birthday parties, funny antics and family vacations there were silhouettes of each member of our family. The words caught my eye as glue sticks and scrap paper swirled across the kitchen table Sunday evening in a mad dash for Monday readiness. The words made me pause. What do people see of me in transition? Is uncertainty visible? Is fatigue? Is optimism? How do you show up? Is it the President Obama from debate #1 or the President Obama from debate #2 or #3? Same person. Different views. The kitchen table encounter with my nine-year-old was the 2nd time in 24 hours that I’d considered the topic of how we project ourselves. The prior evening I sat next to a young 20-something at a fancy evening event. A caveat, I realize that 20 years stands between this woman and myself. I may have read her wrong because of her disinterest in speaking with me….. That said, I was thrown by what this young woman projected. Lethargy. Passivity. Lack of inspiration. A lawyer…she was no slacker. But what she projected, a void, was unmistakable. Have you ever encountered this? I think that we project more of what we’re feeling than we really know. Even the best poker faced among us. Not ready to start that transition you’ve been considering? Are you sure you’re not telegraphing it already? I just finished an incredible article entitled, “Germs Are Us” by Michael Specter. (The New Yorker, October 22, 2012, pg 32+) In it the author re-introduces the human body as a complex self-regulating ecosystem driven by a centuries old compliment of bacteria that operate in perfect harmony with our own genetic structure. He measures the total bacteria count at play in our bodies in pounds. From my read he introduces data that is sure to challenge medicine and medical intervention in our lifetimes. But the ecosystem and its harmony is what caught me. What happens if we defer major life decisions? Does the self-regulatory system respond? Positively or negatively? I want to be careful about how I define ‘project.’ I’m not a fan of our air-brushed society that thrives on what car you drive and the hand bag you carry. Project to me is simply the vibe or energy you give. Here is a funny story that should root you in where I am coming from. When my company was acquired in the early 2000’s I commuted to Dallas, TX regularly for work. I served as the only female on an executive team that ran a >$1Bn division for Perot Systems. Yes, H. Ross while frail and aging still ate in the cafeteria. One time my flight was delayed and I arrived for a day long meeting with only a moment to spare. One of the secretaries pulled me aside to ask, “Honey, can I get you anything?” I was grateful for her concern and her willingness to outreach to me, the foreigner. In this Texas crowd I practically needed a passport given my northeastern home base. She went on, “do you need any make-up or anything.” I graciously thanked her and told her that I didn’t wear any. We were both stunned….for different reasons. I shared with the audience a common refrain that I hear when coaching women. “Can’t.” It manifests itself as “I can’t do that” because “my boss stinks” or “the company isn’t investing in our area” or “our fiscal year doesn’t start until next June” or “my partner may lose her job.” You get the picture…..
We get to decide how we show up everyday. Obstacles are everywhere. What matters is if we let them cast a shadow on us….. In my transition I hope you see optimism and energy and strength. An unexpected gift from my transition has been the grace and humility to celebrate “Nice. Happy. Fun.” What emanates from you? 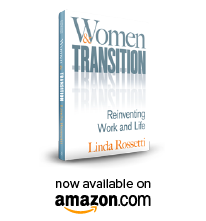 This entry was posted in Observations on Transition and tagged career transition, David Letterman, Germs Are Us, linda rossetti, Michael Specter, novofemina, observations from a women's transition, The New Yorker, transition, women's issues, women's transition. Bookmark the permalink.